Sundays have unofficially become "Sophia Sundays" on my blog but before I do a pregnancy update I wanted to say "Happy Birthday!" to my Grandma! Grace colored a card for her Great Grandma, that is, before she tried to eat the crayons. I don't think she's ready for crayons yet. So, Happy Birthday Grandma! We love you and miss you! Today marks 33 weeks in this pregnancy. I can NOT believe we are 7 weeks or less (probably) from meeting our Sophia Anne! These past four weeks have flown by. I said it on my last mini update two weeks ago, but I am significantly more uncomfortable with this pregnancy. I have had some lower abdominal pain (erm, "some" is really a loose term,) but I have a couple more days until my next doctor's appointment. It makes it difficult to walk, climb the stairs, carry Grace, and, oh yeah, sleep. I had my first Braxton Hicks contractions at 32 weeks and 6 days. I never had any with Grace and it was really unsettling, even though I knew they weren't real contractions. They kept me up all night but by morning, I had realized that I was just a little dehydrated, and with some extra rest and plenty of fluids, they stopped about 12 hours after they started. The belly is straight out, which is both good and bad. Good, because I often feel leaner than I did with Grace. Bad, because I need a pillar to support the belly. My skin is starting to clear up (finally!) and my acid reflux doesn't seem to be as bad. Both are major answers to prayers! We got to see our Sophia girl at our 31 week appointment. I was suddenly measuring alot larger than I had been, so our doctor just wanted to check and make sure everything was okay. She looks wonderful and is in perfect health. 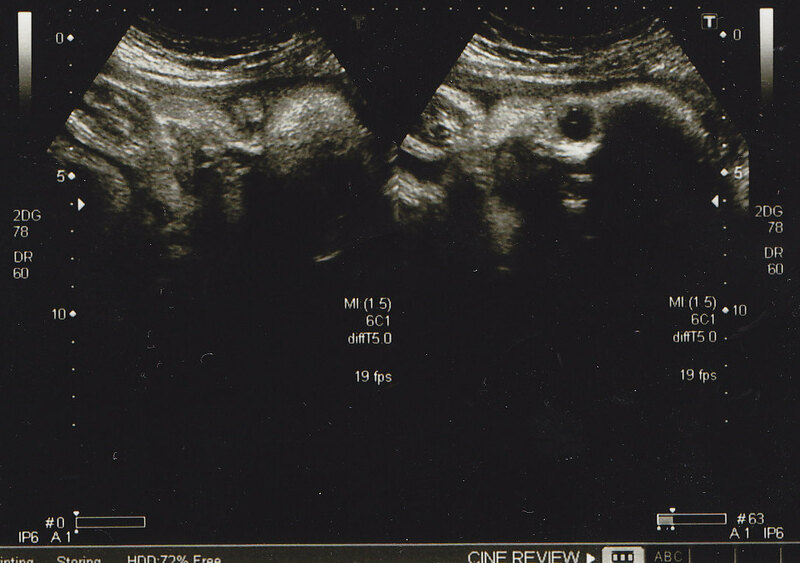 The radiologist was able to confirm that she is definitely a girl (they weren't very sure at our gender ultrasound,) and even did a measurement of her (they've never done that at any of my ultrasounds before.) Sophia was weighing in at 4.2 pounds at 31 weeks! We're praying that the measurement is wrong, because that means she would be a pretty large baby 9 weeks later! Look at those huge chubby cheeks! We finally have a plan in place for when and how we are going to get ready for Sophia. I'm pretty confident it will come together in the next couple of weeks. For now, we're "preparing" Grace for having a baby around. We don't think she is really aware enough to understand, but she will be aware that our focus and her home environment has changed. We do alot of playing with a baby doll, making it cry, swaddling it, feeding it, finding it, etc. She just started doing "Where" hands- I love it! You look great! 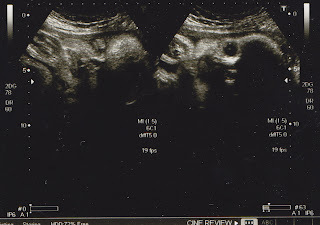 Glad they were able to confirm that she is definitely a girl, and how cute is Grace with her little "where" hands? LOVE this. I agree, you do look leaner and the belly does look straight out! wow! Brad even gave a wow when he saw your picture! You look wonderful, friend, and I'm sad that I won't be there with you for baby Sophia's arrival! Don't worry, though, she'll fall in love with me and "Uncle" Brad soon enough! LOVE YOU! I love Grace's "where" hands! Absolutely adorable! I can't believe it's only 7 weeks til she arrives. From my end, your pregnancy has seemed to fly by, although I'm sure it doesn't feel like that when you can't sleep comfortably anymore. you look great! and Grace is too sweet!